Summer time weather is awesome, but when the thermometer hits the 90 degree point, you start looking for creative ways to cool off. Here’s a “cool” idea; a unique floating bar concept I drew up last year. It all started one hot summer afternoon, many years ago, some friends and I were floating around on inner tubes on the Eagle River chain in Northern Wisconsin. While drinking beer and getting totally sunburned we hatched this fun idea…a floating bar with sit down/stand up platforms and a top sunbathing deck. Floating Bar Concept – designed for lake use. It’s like a swim raft but with a few added bonuses. Stand up or sit down using the two opposite facing seating areas and two opposite facing swim up standing areas. A 5 gallon bucket of concrete anchors the platform. The raft itself is low profile allowing you to easily set your beer on the “bar top”. Unlike a dock or typical swim raft, this design sits low in the water, revealing no open underbelly where those creepy water spiders tend to hang out. Launching the swim up bar is easy, especially in cold weather areas when the lake is frozen. In warm climates, the base skids allow for easy launching by dragging it to the water’s edge. Check it out and be the first to build this crazy concept ‘swim up bar raft then and send us your photos! 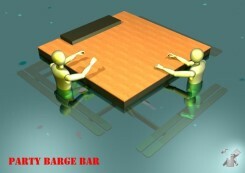 The EMBP-21 floating bar drawings are included with membership to our bar design website. Designed for up to 16 comfortable sitting and standing positions using computer generated human scale models. Ample room on top for bikini clad sunbathing bartenders. Swim Up Bar Spotted at US Virgin Islands Resort? 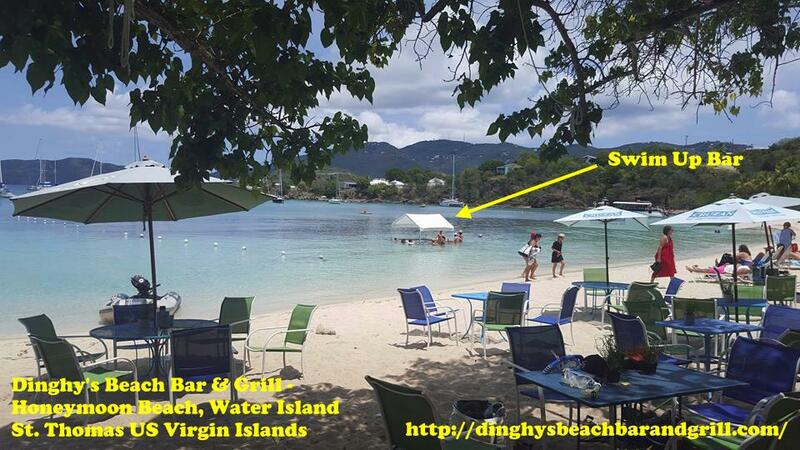 Some time ago, a resort at Honeymoon Beach on the island of St Thomas, US Virgin Islands inquired about building one of these for their guests. Can’t wait to see it. Update: while browsing their website recently I spotted something floating out in the bay with people around it under a sun shade canopy. Looks like they built it…hope they used stainless fasteners.